Performing on Wednesday, June 1st 2016 at 10:00pm. Suggestical uniquely improvises an original 22 minute musical comedy based off of an audience suggestion. 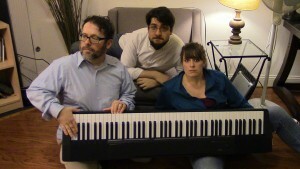 Our group is composed of two improvisers, Rick Horner and Claire Halberstadt, and a pianist, Zach Wiseley. So far we have performed to sold-out houses all over Philly, including Duofest. Everything we perform is original, never-before-seen material, and the audience has a great time.